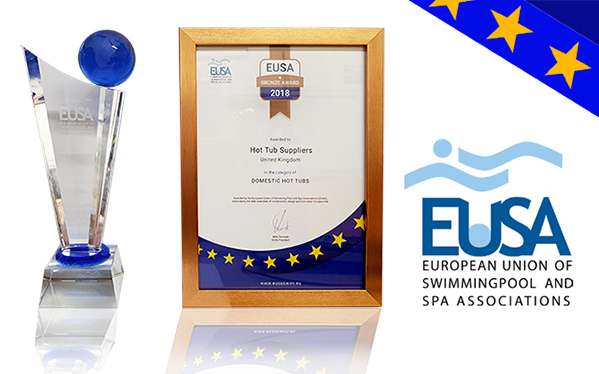 We won the bronze award at the European Union Swimming Pool & Spa Association (EUSA) Awards held in Lyon France. The awards were the climax to the 4-day show which is the biggest in Europe & attended by exhibitors & visitors from all over the world. 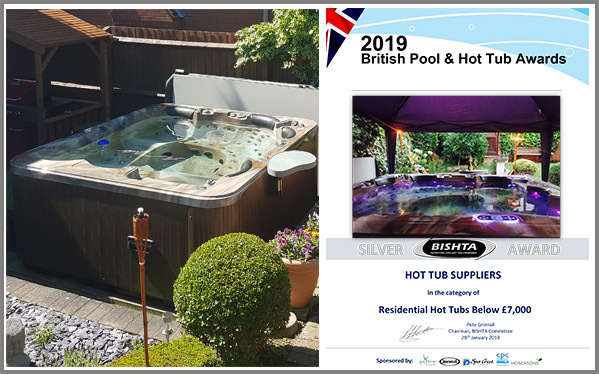 Our award was for the best domestic hot tub category, this was a project submitted by our buyer, Jill & Ken Dewhurst who designed a project with the purchase of their Duke Deluxe hot tub in midnight grey which was perfection both technically & visually. EUSA presents 2700 companies across Europe so to be in the top 3 is an amazing achievement & we were very honoured & proud to collect the award from EUSA President Mille Ornmark with BISHTA managing director Chris Hayes in close attendance. This condition effects all 4 limbs (arms and legs) with restricted movement throughout the body. If this was not bad enough, Joseph was registered blind as well and it was decided he required 24 hour personal care. Peter, Joes father called ourselves in spring 2017 about hot tubs with good hydrotherapy. 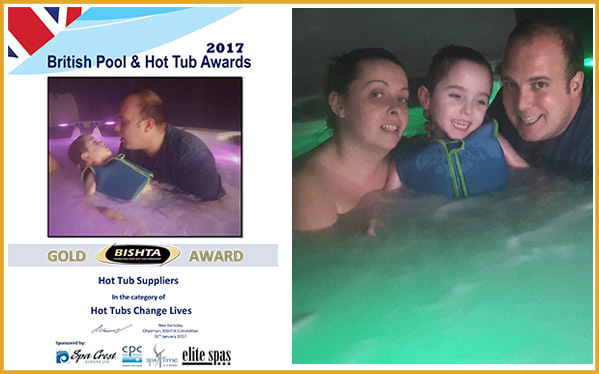 Peter called us after the school where Joseph attends recommended hydrotherapy as a way to improve Joseph’s movement, Peter then decided on a hot tub and together we discussed models and in November 2017 we delivered and installed the Zspas Poseidon model. 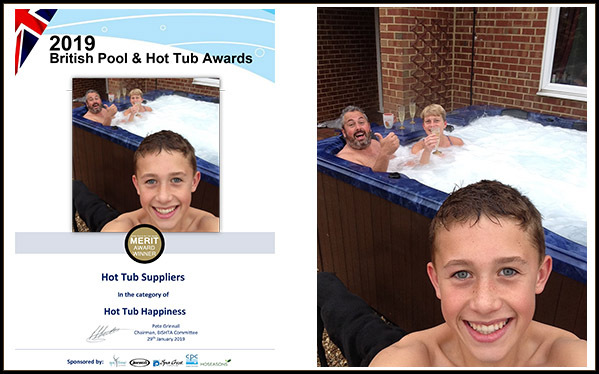 We was delighted to collected the Merit Award in the catagory "Hot Tub Happiness". The image which we entered is one our favourites from our buyers Mark & Judith Apps with son Ryan. The image was taken soon after the hot tub was delivered & captures the collective family mood which the new Poseidon Deluxe hot tub bought. This category is high on volume & quality of entries so to receive the Silver Award on behalf of Stuart & Donna Franklin gave us great pleasure. Stuart order the Emperor Deluxe hot tub in the colour champagne & oak cabinet to compliment the gazebo and barbeque hut. The natural colours of the hot tub match the wood effect the sheltered areas plus also merge with the natural greenery of the Stuarts garden. This category is high on volume & quality of entries so to receive the Bronze Award on behalf of Phillip Cross was amazing. The Bronze was the first time we had 2 awards in the same catagory to compliment our silver for a similar project. Phillip Cross had to use all his experience as an engineer to design the hot tub project at the family home, the biggest obstacle was to chisel the surrounding limescale to allow space for the hot tub to sit. The project took 4 months to complete & as the area is high in limescale, Phil is very aware of maintaining the water balance especially maintaining PH levels. Phil ordered the Duchess Spa Touch hot tub in pebble grey with steel grey cabinet. 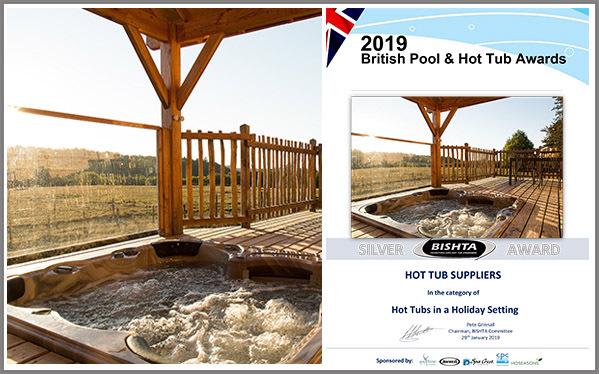 We collected the Silver Award for the best hot tub in a holiday location on behalf of Natalie & Andy Soloman who ordered the Countesa hot tub in champagne shell with oak cabinet. Andy & Natalie Solomon first hatched their plan for an up market glamping site in their native Shropshire. The plans were made but due to restrictions in planning their dreams dealt a temporary blow until Andy decided on a new location for the project ……. Limousin. Limousin , is a region located in the south central France , 280 miles south of Paris and 750 miles south of Shropshire ! Andy and Natalie’s project is also going to be featured in channel 4 documentary in spring of 2019. 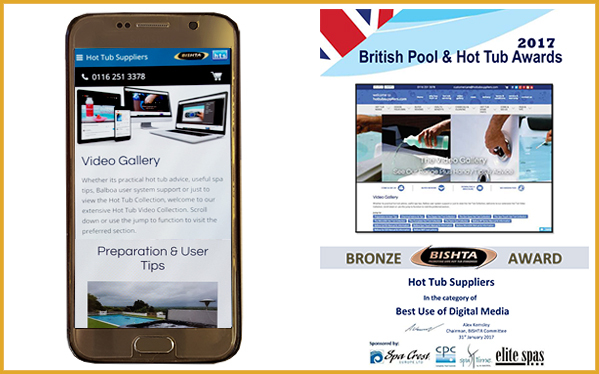 Our work on Digital Media has earned us the Bronze Award at the recent British Pool & Hot Tub Awards. Our media portfolio boasts over 200 videos & covers work from chemicals to user guides & maintenance tips. The videos are widely available & we have received post comments from all over the world with USA & Europe very active in this area. The goal for 2019 is to keep developing more advice videos to help new & existing hot tub owners & maintain the standard we have set. 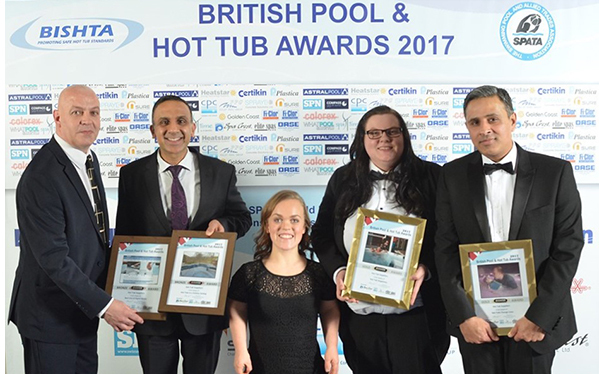 These annual awards highlight the achievements of the wet leisure industry by showcasing the best examples of design, construction, installation & innovation. This year the event was held at the Ricoh Arena In Coventry & Guest of Honour was Wasps rugby union star Charlie Matthews who presented awards on the evening. In total we collected a record 6 awards, Silver for Hot Tub Health Benefits (Poseidon BP Deluxe) , Silver for the Best Hot Tub Under £7,000 ( Emperor Deluxe ),Silver for Best Hot Tub in a Holiday Location ( Countesa with 282 upgrade ), Bronze for Best Use of Digital Media, Bronze for Best Hot Tub Under £7,000 ( Duchess ) plus a Merit Award for Hot Tub Happiness . We were delighted the collect the Gold Award for the 3rd year in succession. This time we collected Gold on behalf of Stephanie & Derek Headrige for the hydrotherapy benefits gained by their daughter Amy. Amy uses her Perseus Deluxe 3-4 times a week & the hydrotherapy benefits help relieve pain from muscle spasms, improves circulation, helps maintain a range of motion in her joints, helps relaxation & most importantly allows her freedom and being able to spend quality time with friends & family in an activity that can be enjoyed by all. This category is high on volume & quality of entries so to receive the Gold Award on behalf of Jill & Ken Dewhurst gave us great pleasure. Jill & Ken designed the garden alongside the delivery of their Duke Deluxe Spa Touch Smart hot tub. The childrens play area ( they are grown up now! ), overgrown bushes & trees were all removed to create an more open space for Ken to start work to create a design which is not only amazing on the eye, but has all the preparation guidelines we recommend for a sunken hot tub project all ticked. The biggest compliment is to affirm that the garden design compliments the surrounding area of the West Wales countryside of Cwmsymlog. This project is without doubt one of the best designs we have had the privilege to work on. 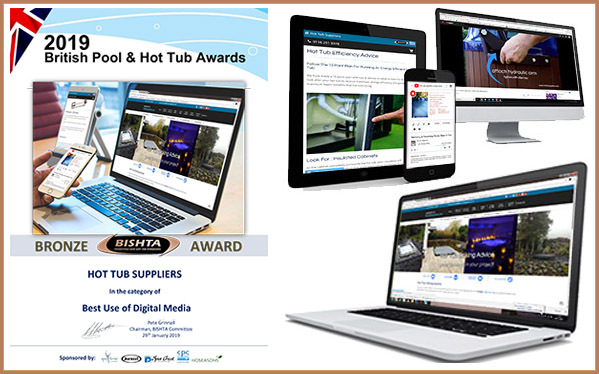 Our work on Digital Media has earned us the Silver Award at the recent British Pool & Hot Tub Awards. Our media portfolio boast over 200 videos & covers work from chemicals to user guides & maintenance tips. With over 12,000 views on the hot tub preparation, 6000 views on cloudy water plus a staggering 42,000 views on how to use a balboa spa system, it re assures us that our work has demand & is appreciated by the hot tub public. 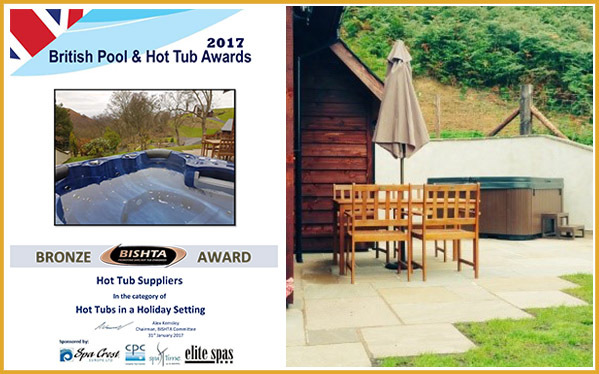 We collected the Bronze Award for the best hot tub in a holiday location on behalf Tony & Karen Davies of Otters Leap Lodge in North Devon. 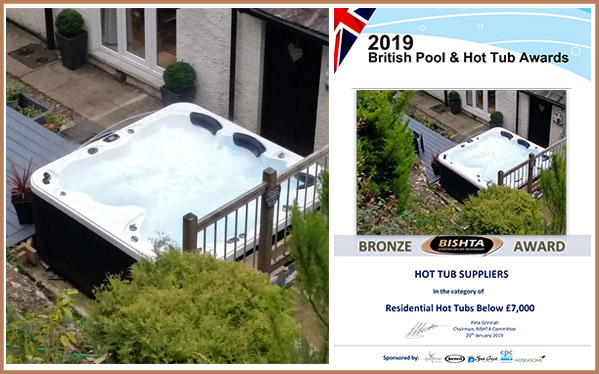 Tony & Karen ordered the Countesa hot tub in colours to befit the furnishings of the luxury lodge and the hot tub was commissioned, photographed and sent over to the letting agents for advertising the property for summer 2017. This year the event was held at the Ricoh Arena In Coventry & Guest of Honour was 400 metre Olympic Champion Sally Gunnell OBE DL who presented the awards during the evening. 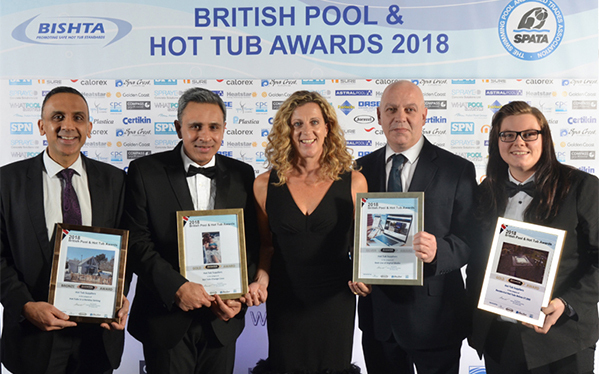 In total we collected 4 awards, Gold for Hot Tub Health Benefits , Gold for the Best Hot Tub Under £7,000 ( Duke Deluxe ), Silver for Best Use of Digital Media & Bronze for Best Hot Tub in a Holiday Location. 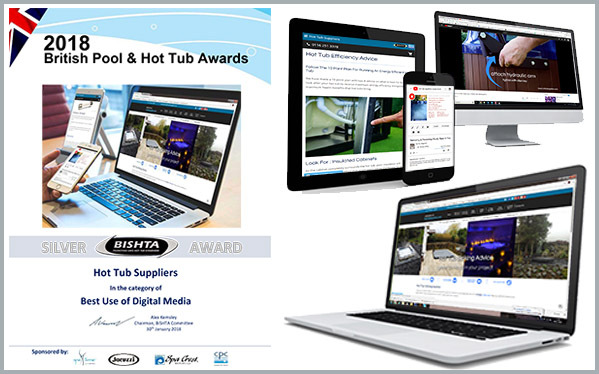 Our Hot Tub Suppliers website received Bronze award for the use of Digital Media in 2017, we was praised for the increased use of help videos on the website & that most of the media was concerned with help & advice rather than sales. We have received comments & calls from user all over the UK and Europe on the help our video manuals have given. 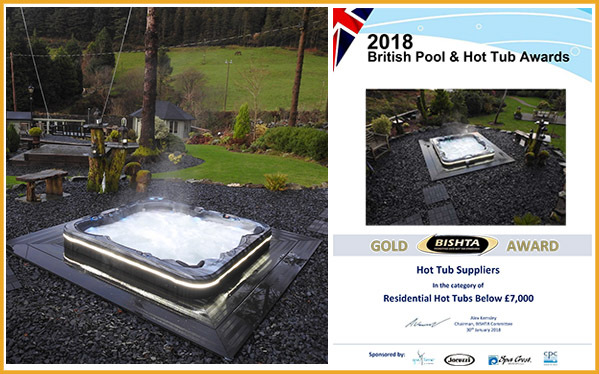 We collected the Bronze Award for the best hot tub in a holiday setting on behalf of Slate House Lodges. Slate House Lodges is situated in Powys an area boasting panoramic views over the tranquil mid–Wales countryside. With such a relaxing and peaceful setting, the addition of a hot tub was an obvious option which has reaped benefits for the owner Mr Paul Jandrell. So strong was Pauls instinct to invest in hot tubs, all the lodges were designed with an added private patio where a hot tub is situated. 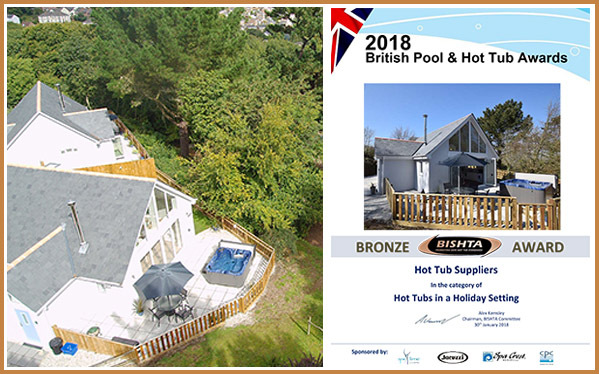 The addition of the hot tub has increased demand & turnover of the business, the lodges of course receive reviews & they all mentioned the addition of the hot tub was a main factor in booking the lodge in what is a very competitive market. We won Gold Award in the category of Hot Tub Happiness in 2017. 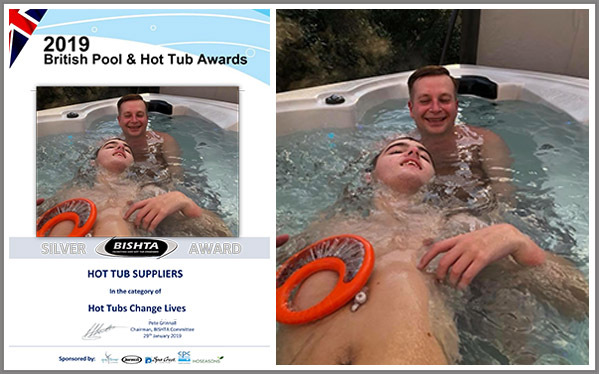 This section specialises in the effect hot tubs have given to an individual and our story about our customer George Shillito. George is featured on the website on the buyer reviews banner because he was a buyer who came to use with questions & had some doubts, after our work he wrote an 800 word review plus sent us many images of his project and of him standing proud next to his new Countesa model. This picture shows the pride & content deserving of the effort George placed in his project from his carefully draw up plans of his garden to help the installers, to his 800 word product review. We collected the Gold Award on behalf of deserved winner Dayton Smith & parents Jamie & Elaine. Jamie & Elaine ordered the Emperor Deluxe hot tub as part of a 3 year plan of setting up a sensory room at their home & buying physiotherapy equipment to help Dayton’s muscles to develop. The hydrotherapy benefits of the hot tub, has gained muscletone & improved Daytons walking with his frame. 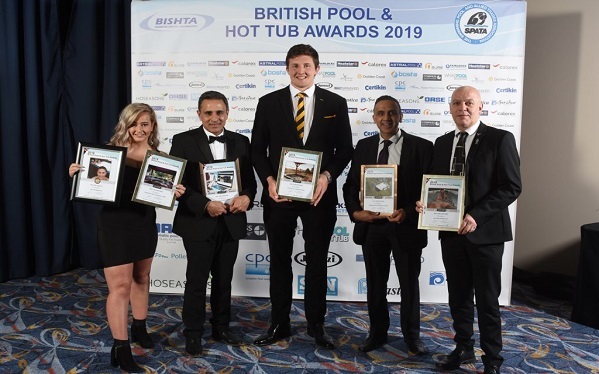 The event held at the Ricoh Arena was another succesful evening with us collecting 4 awards including 2 Gold awards for Health Benefits plus Hot Tub Happiness . We also Collected 2 Bronze Awards for Best Hot Tub In a Holiday Location plus Best Use of Digital Media . Guest of honour was multi Paralympic champion Ellie Simmonds who presented the awards during the evening . 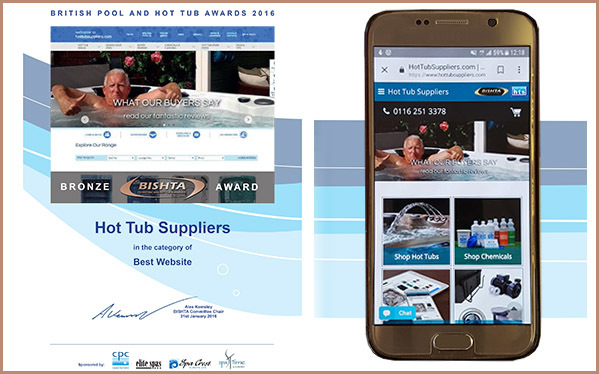 Our Hot Tub Suppliers website received the Bronze Award at the British Pool & Hot Tub Awards for 2016. Always a very competitive field so to be voted in the top 3 websites in the country was a very proud achievement. Use of digital media, the sense of realism with our reviews & articles was part of the strong the feedback we received. 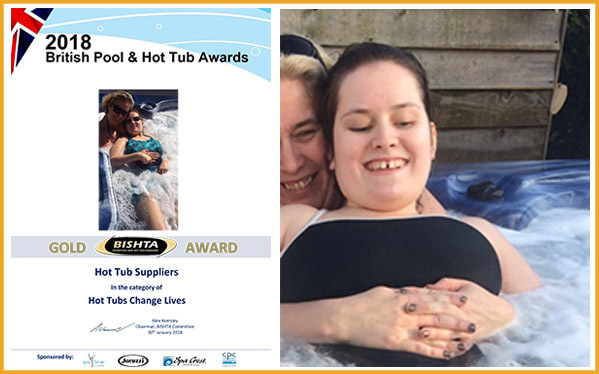 We collected the Gold Award for Hot Tubs Changes Lives, a category which highlights the health benefits of hot tubs & how they change the lives of those who use them for hydrotherapy. 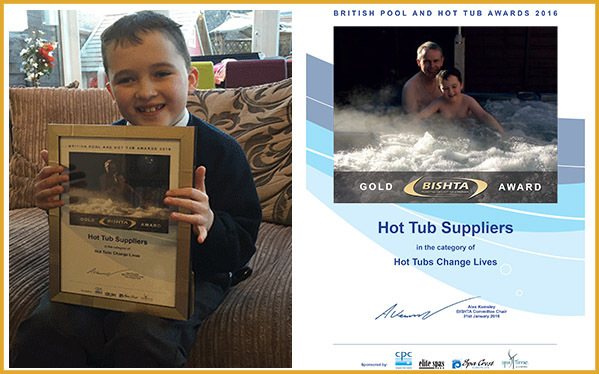 Christian Rogers was the deserved winner & thanks to the work of parents Paul & Yvette, we supplied the Emperor Deluxe Hot tub which aided Christian immensely during his work before & after a life-changing operation which would enable him to walk unaided. 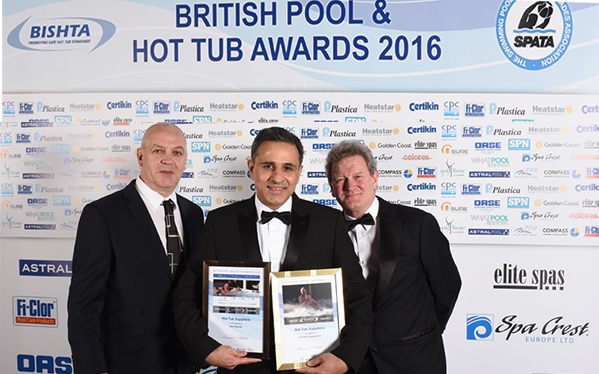 2016 was our first triumphant year at the British Pool & Hot Tub Awards held at the Coventry Ricoh Arena . 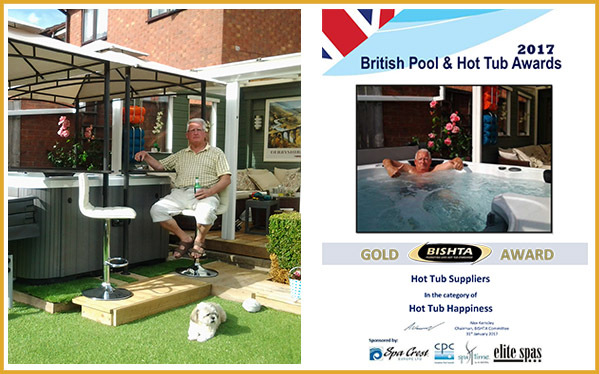 Hot Tub Suppliers collected Gold for the first time for Hot Tub Health Benefits plus a Bronze for the Best Website.